A couple fish that hooked up at the same time. Sunny and Pleasant, Water Temperature 63* and Clear. This morning I caught bait early, picked my clients up and set out a spread of boards. This was the first time Christian had ever been fishing so I was excited for him, knowing what I knew what was about to happen to him. He hooked up first and the fun began. He did great and we boated the fish after about a minute battle. Now we were ready to have some fun. We took hit after hit and I believe I had more fun watching their faces as they reeled in the fish than they did. We had a couple hook up at the same time and after I netted the fish both of them acted like their hands and arms were paralyzed from the ordeal of reeling in the fish. They kept some fish to take home and released the others but what they will also take home are some great memories of catching fish on a Spring morning on a beautiful lake. DP took these guys out this morning for some "Catching" for Stripers and looked like they did pretty good. This morning I went out early to hang lights then caught bait and picked my clients up at the break of dawn this morning. We set out a spread and pulled for a few hours then made a move. We worked depths ranging from 3 to 30 feet today and fish hit in all different depth ranges. My clients thoroughly enjoyed themselves today... the weather, company and fishing was excellent. Maybe Spring is here to stay! 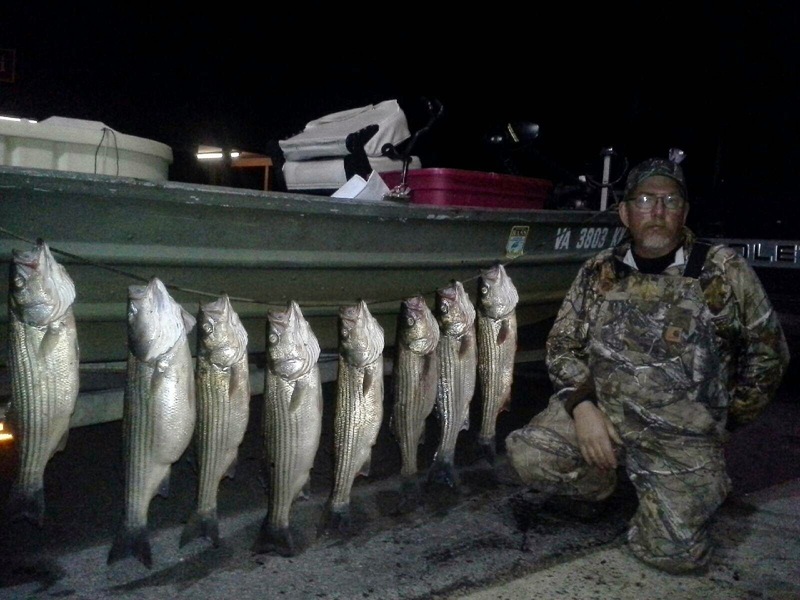 Yesterday Tony went Turkey hunting in the morning then took Jimmy Striper fishing in the afternoon for a couple hours. Life is tough, wonder what they are going to do today? Today"s trip was a Christmas present given to her Dad and Sister Kelly from Kim. I had caught bait by the time I picked them up at 6:30 so we were able to start fishing immediately. As luck would have it I started getting my spread out and a boat ran right down the whole bank that I was going to fish. We still hit the bank because I did not want to waist the baits but only got rolled several times, the fish were spooked. After moving to another bank we continued to take hits but had marginal hook-ups. We worked different areas through out the morning with fish working our baits about everywhere we tried. We probably had 50 hits today and the family got to take home enough fish for this holiday weekend's bash on the lake. Mark is pictured holding a 15 pound Striper. Looks like the lake is going to "Turn On" finally and fishing should improve greatly. Today Tony, DP and myself wanted to take our sons out for a couple of hours to have some fun on the water. Everyone met me at 10 at my house and off we went to the lake. After catching bait we only had a couple hours to fish before having to get back for baseball practice. We set out a spread of boards and worked an area about 500 yards long. Michael took the first fish on and brought it to the boat, a nice 10 pounder. Alex hopped on the next rod and landed one about 6 pounds. Then we hit a spot where it got real crazy and they all reeled in fish after fish. We moved away from it and hit one more point and that is where Alec's 14 pound Striper tried to pull him into the lake. He battled it for about 5 minutes before we finally boated the fish. If there was a boat within a mile of us they probably thought we were beating the kids because of all the screaming and moaning. Alec thought he had broke his hand reeling in the fish but in the end he was just fine. We could not figure out if the boys enjoyed the fishing or just being together more, there were just smiles the whole time. Cloudy, Rain and Wind, Water Temperature falling from 61* this morning to 57* at 2pm. Today was another terrible weather day on the water with wind gusts exceeding 30 mph and rain blowing sideways. Guide Tony met the guys early this morning but had to pick his times between fishing and trying to stay dry in the truck. They all hung in there and produced a great stringer of Stripers. Today boat traffic was certainly no issue as is evident by the stringer. We got early this morning to catch bait but we had to throw for a couple hours to get enough to get started. We set out a spread of boards and started taking hits on points. The weather was horrible. The cold, rain and occasional gusts made the day quite uncomfortable. We pulled for about 2 hours this morning before running out of baits then spent a couple more hours restocking the bait tank. This morning when the wind was blowing out of the East we took plenty of hits but the fish did not seem to really want the baits. The fish would hit the bait and pull the planner board 10 to 20 feet across the surface then simply let go. In the afternoon the wind changed to to West which changed the fishes attitude. The Stripers would hit the baits better increasing our hook up ratios considerably. Then the wind changed again to out of the North turning the fish off. Although the weather was poor today and the bite was fickle we had plenty of fun and action. 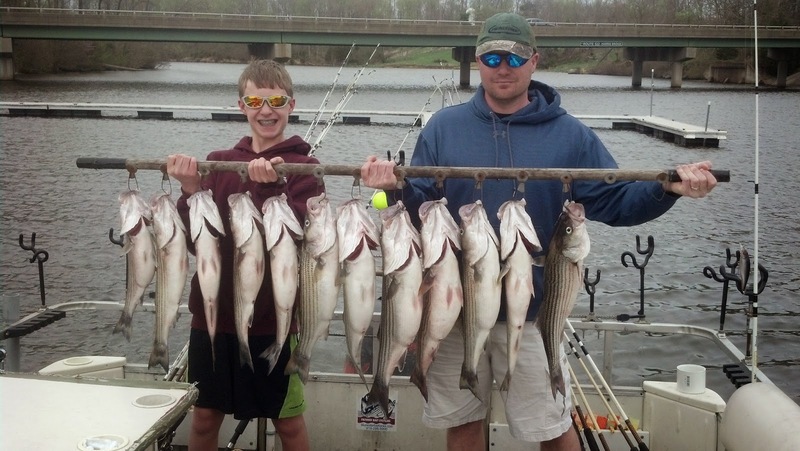 We had over 30 strikes boating 12 Stripers and a few Catfish. Joe is pictured holding his 11 pound Striper. The water temperature dropped over 3 degrees while we fished today. I met my clients at 6 and caught bait easily this morning. We had our spread out at daylight pulling beautiful baits over shallow flats. Today we had about 20 strikes and had fun catching Stripers. Joseph was going to bring his younger son but he had some medical complications last night and could not make it today. More fish for Josh to reel in but sad brother could not make it. We had steady action this morning but the bite slowed this afternoon. Today was a beautiful day on the water with plenty of action and good company. Josh's big fish was 8 3/4 pounds. Hope younger brother gets well soon. Guide DP took Kenny out for an afternoon of fun catching Stripers. Guide Brian who also sells homes for Emerald Homes in Richmond wanted to treat Ray and the guys to trip to the lake so Brian cooked up a feast Monday evening for them, housed them in the lake house and took them fishing today for Stripers. We threw for bait for a couple of hours then picked up the crew and went fishing. Once we got all of our baits out we started taking hits and Sean reeled in the first fish of the day. We worked the area for about an hour catching fish then caught some more baits and set up in a different area pulling planner boards. We caught fish there as well before deciding to make one more final move. I had to get off the water early for an appointment so we put out 14 lines then emptied the bait tank and took a picture of the guys holding up some fish. While I was popping the picture we hooked up and boated a Striper and before we could get our lines in another fish met his doom. We ended up with 14 Stripers for our efforts today. The water is finally warming which is going to turn this lake on.